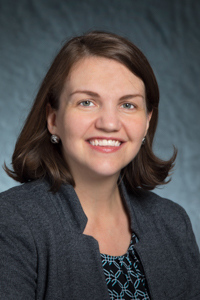 Sarah Runcie, PhD, will speak on April 4, 2019 at 2:00 ET in the Lister Hill Auditorium at the National Library of Medicine on “Naming, Networks, and Power in Histories of Medicine in Africa” as part of a panel. This special program Viral Networks, Reconnected reunites three scholars who participated in the January 2018 Viral Networks workshop at NLM—funded by the National Endowment for the Humanities through a grant to Virginia Tech—to share the progress of their research and their thoughts about the future of the digital humanities and the history of medicine. Sarah Runcie: I recently moved to Louisiana to begin a faculty position as Assistant Professor of African history at the University of Louisiana at Lafayette. Before beginning this job, I lived in New York City where I completed my PhD in African history at Columbia University. I studied African history as an undergraduate but then worked in the non-profit sector focused on public health before I pursued my doctorate. In my research, I bring these interests and experiences together by studying the history of public health and medicine in modern Africa. In a typical workday, I’m involved in different activities related to teaching, research and service work on campus. This spring I am teaching a survey class of world history as well as a new class I designed on Africa and World War II. I find that few students in the United States have been taught very much about African history but are eager to learn about this past. It’s very satisfying to explore these new perspectives with them. When I’m not teaching or meeting with students, I can be found working on my current research and writing on the history of decolonization and global health programs in Cameroon. CN: Your chapter in the newly released Viral Networks book is titled “Networks of the Unnamed and Medical Interventions in Colonial Cameroon,” would you tell us a little of what you discovered about the work of mobile health teams in French colonial Cameroon? SR: The mobile health teams in French colonial Cameroon are the basis of my ongoing research—from my doctoral dissertation to my current book manuscript. French doctors created these teams across colonies in Africa to travel to rural areas and assemble people for examination and vaccination. The teams have a complicated legacy, because many things about them were very “colonial,” such as the use of coercion to make Africans comply with the medical interventions of the teams. One thing I’ve always been interested about with regard to the teams, however, is how French doctors really celebrated their work as a major achievement of French medicine in the colonies, but how heavily they relied on the labor of Africans whether as medical auxiliaries or porters. In my chapter for Viral Networks, I had the chance to think through what it means to try to visually represent this labor, given that African participants are often not counted or named in the same way as the French doctors in the archival records of the teams. One of the main questions I explored is : how can I bring my research perspectives and commitments to life with digital tools? 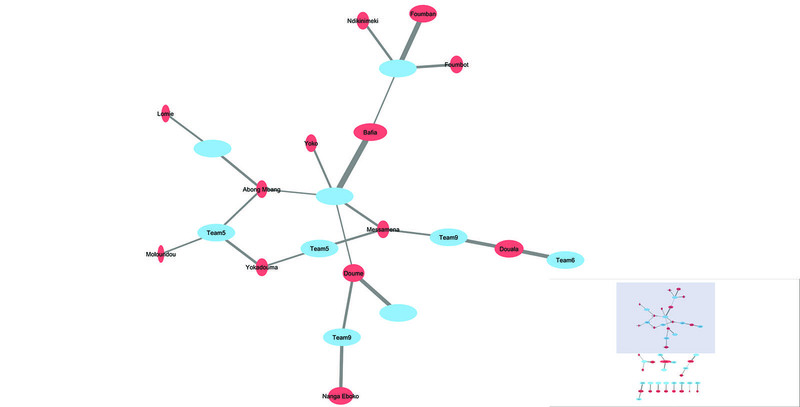 Figure 1.1 Team head names shown, mobile health team Visits, 1947-1951 (portion of graph) The Blue ovals (nodes) represent the mobile health teams and the red represents locations of the visits. The red oval size is based on the recorded population for that location. The width of the connecting lines (edges) represents the number of patients seen at each visit. 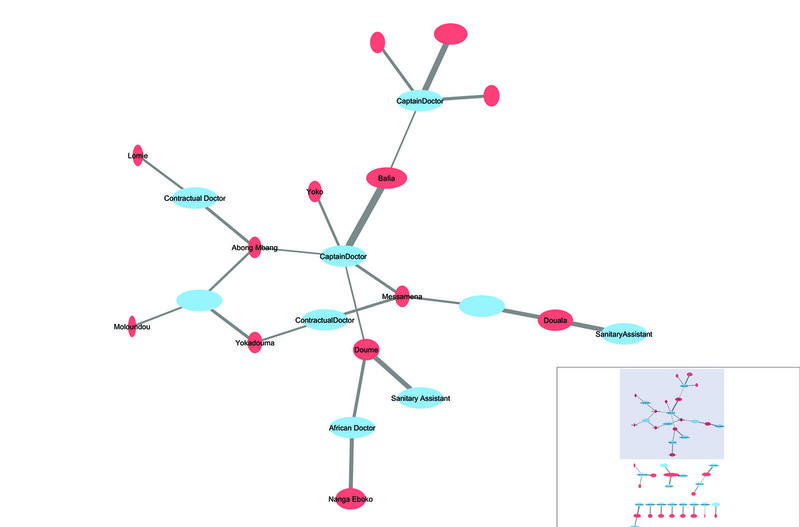 CN: You used network analysis in your research, what is this technique and how was it useful in this case? AR: Network analysis is a framework to help us think in new ways about how people, places or events are connected to one another. I was new to network analysis when I participated in the workshop that led to the publication of Viral Networks, but I found that it helped me think in new ways about my research. 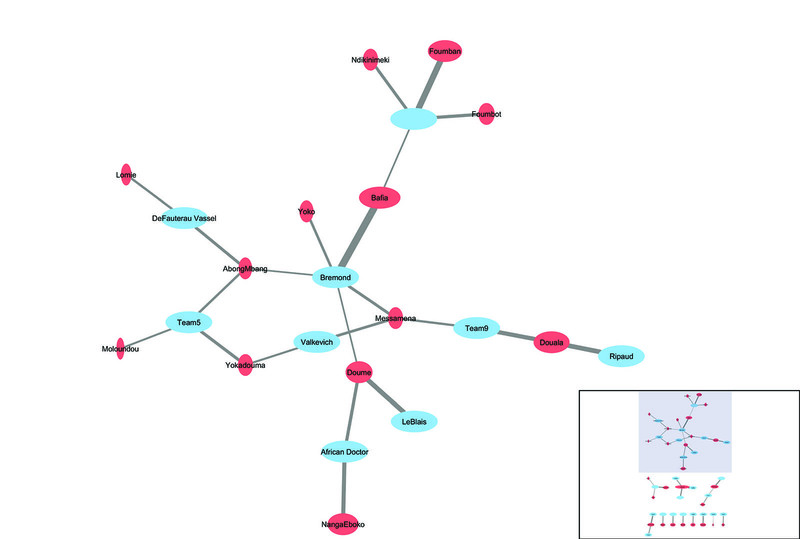 For this project I created a database on mobile health team visits using colonial medical records and then used the program Cytoscape to create a network analysis of the work of mobile health teams. This program allowed me to create different visualizations of the connections between different mobile health teams and their work. Before this experience I have tended much more towards qualitative analysis in my scholarship. For example, I might be more drawn toward recounting the story of an individual visit of a mobile health team in Cameroon, focusing on the intricacies of human interaction, more so than crunching numbers to figure out how many villages each individual team was visiting in a given year. Historians need to deal with both the micro and the macro, however, and network analysis was for me a way to look at the same sources I have been using in a different way. Thinking of these sources as data sets, and asking what they can reveal in this aggregate form, helped me think about historical patterns in new ways as well as some of the concerns of digital humanities. Figure 1.2 highlights the professional rank of the team head. CN: What concerns did you have with your data source and how did you address them? SR: The main concern I had about my data is a very standard concern of historians of Africa which is that I was using colonial records produced by Europeans to try to analyze African history. The names and perspectives of Africans themselves are often absent from such records. Scholars who study colonial Africa, and certainly colonial medicine, have been discussing this issue for a long time. In thinking through this concern for the purposes of network analysis, I found the work of other scholars writing on digital humanities to be very helpful. In my chapter I discuss the work of Lauren F. Klein; her analysis of how the stories of the enslaved can be reframed away from merely “absences” in the archival record was very useful to me. I began to see that I had choices in how I used my data, choices that could be driven by my interest in understanding the work of Africans themselves as practitioners of biomedicine in the colonial period and beyond. Figure 1.3 removes all information about the team head and highlights the administrative designation of the team, when available. SR: Libraries are absolutely fundamental to the research I do. I’ve relied on libraries around the world, particularly medical libraries, to further my research—everywhere from the holdings of the Pasteur Institute in Cameroon to the library of the World Health Organization in Switzerland. The rare holdings of such libraries have been really crucial to me in uncovering complex transnational conversations between African, French and international health officials that I focus on in the part of my research that moves into postcolonial Cameroonian history. At both my doctoral and current institution, I’ve also relied heavily on the generous help of librarians in tracking down more obscure articles and books. CN: What’s your next step? Are you continuing a line of research discussed here? SR: In the coming months, I will be focused on working on my book manuscript on the history of decolonization and global health programs in Cameroon. This project continues my writing on mobile health teams and African biomedical practitioners, and my experience with the Viral Networks workshop and book has certainly helped me develop some new perspectives on that work. I’m also excited about the possibility of using more digital tools in the future to help students learn about the history of disease and medicine in Africa. Read Sarah Runcie’s article in Viral Networks: Connecting Digital Humanities and Medical History, comprising a collection of research papers resulting from the Viral Networks workshop, now available from VT Publishing and NLM Digital Collections. Sarah Runcie’s presentation is part of our ongoing history of medicine lecture series, which promotes awareness and use of the National Library of Medicine and other historical collections for research, education, and public service in biomedicine, the social sciences, and the humanities. All lectures are live-streamed globally, and subsequently archived, by NIH VideoCasting. Stay informed about the lecture series on Twitter at #NLMHistTalk.